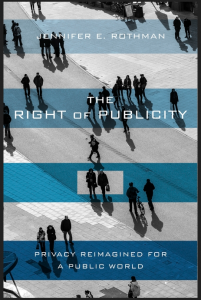 If right of publicity/privacy is your thing, Jennifer Rothman, Professor of Law and the Joseph Scott Fellow at Loyola Law School, Los Angeles, has just penned a new book precisely on this topic, The Right of Publicity: Privacy Reimagined for a Public World (Harvard U. Press). The right of publicity is a law that few people outside of Hollywood know much about. Nevertheless, it is an increasingly important right in our digital age even when celebrities are not involved. The right of publicity provides a right to control uses of your identity, particularly your name, likeness and voice, and to stop others from using those without permission. The boundaries of these state right of publicity laws vary widely from state to state, with some limiting the claims to uses in advertising or on products, and others allowing almost any claim when the use is for the defendant’s advantage. Some states limit claims only to those brought on behalf of the living, while others extend such rights after death. In the book, I consider both the opportunities and risks that such right of publicity laws pose. I challenge the conventional, yet erroneous story of the right of publicity’s development, and by doing so I provide direction on how to avoid the right’s current dangerous path. The right of publicity in its current form jeopardizes the liberty of the very individuals that it is supposed to protect, while also interfering with free speech, and copyright law. Here’s a link to Rothman’s Right of Publicity Roadmap; a great resource on right of publicity and privacy laws, state by state. This entry was posted on Tuesday, May 15th, 2018 at 3:48 pm	and is filed under Feature, Free Speech, Privacy. You can follow any responses to this entry through the RSS 2.0 feed. Both comments and pings are currently closed.